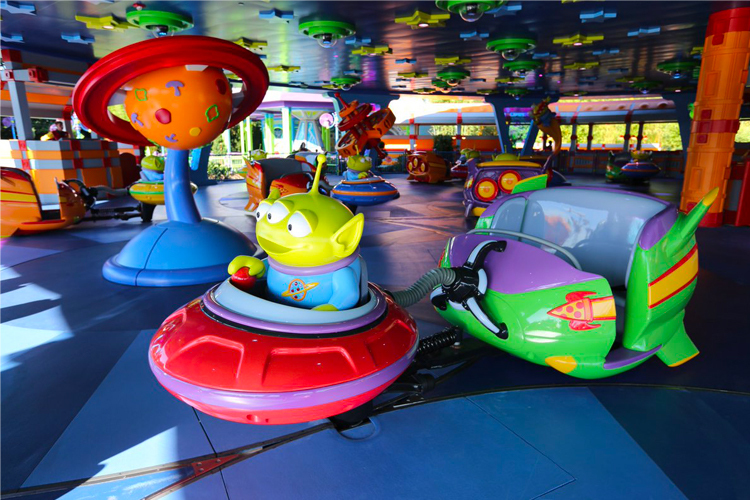 On Alien Swirling Saucers, guests can step aboard an alien-guided rocket ship that Andy won at Pizza Planet! The ride whirls and spins you around the planet of Pepperonia. Walking up to Alien Swirling Saucers you might recognize the similarities between the font typically used for Pizza Planet, and the font styling on the attraction’s signage. One thing I immediately noticed was that the front half of the queue generally looks a lot like the Buzz Lightyear Space Ranger Spin queue in the Magic Kingdom. 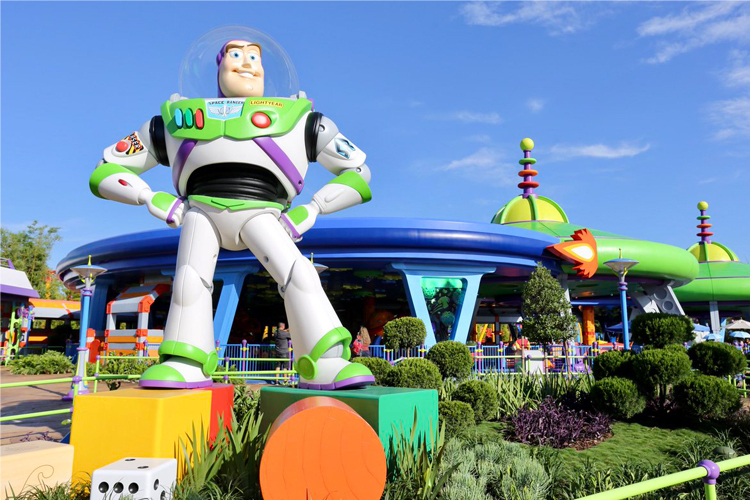 The second half of the queue maintains the cartoonish space station feel, but instead of the iconic Buzz Lightyear purple and green color combination, it shifts to orange and silver. 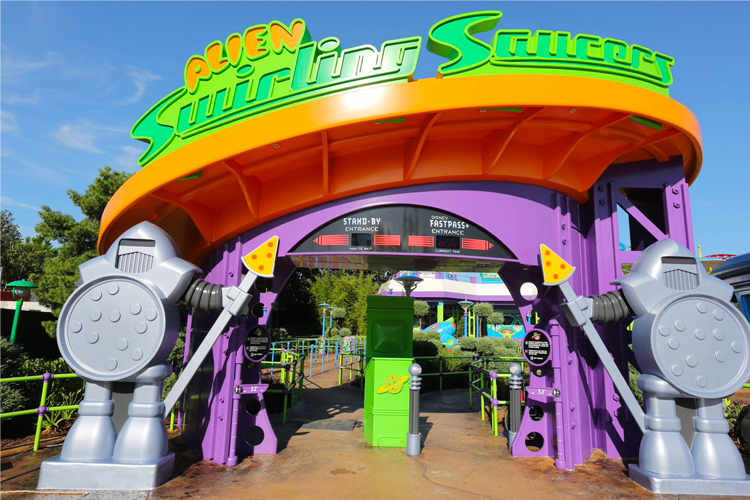 The Alien Swirling Saucers queue has no indoor/air conditioned section. This will likely be problematic for young families waiting in the summer months. There are certainly some cool theming elements in this queue, including the spaceship-shaped box that Buzz Lightyear was packaged in and a giant laser gun. It was surprising that this queue featured zero interactive elements. Guests walk out onto an open platform to board their toy rocket ship, which is being captained by a green alien. 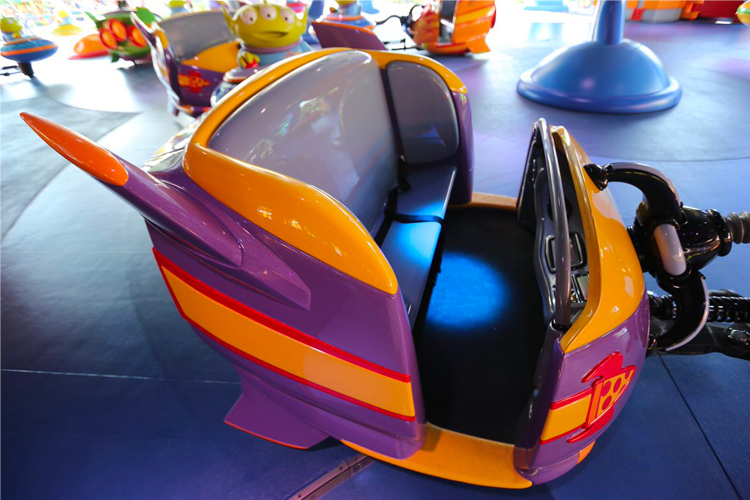 Once the ride begins, you start zipping and zooming around as “The Claw” looms over you. The Claw dangles from the ceiling, carrying one lucky green alien who has already been chosen. Obviously, The Claw wasn’t going to swoop up random guests, but I was slightly disappointed that it doesn’t even move. While you do spin and whirl around, it isn’t as intense as the Mad Tea Party attraction in the Magic Kingdom. You don’t really need a strong stomach to handle Alien Swirling Saucers. Long before it opened, this attraction had already been compared to Mater’s Junkyard Jamboree at Disney California Adventure by many in the Disney community, and that comparison is spot on. Some could argue it is slightly better than Mater because it is covered for protection from the rain, but that’s just nitpicking because Anaheim doesn’t really have to deal with rain compared to Orlando. Aboard the rocketship there are buttons. Don’t be fooled — these don’t do anything. I am ashamed to admit that it took me a couple seconds to realize this. Kids are going to love this attraction, and at the end of the day, that’s who Disney Imagineers built this ride for. It is essentially a glorified carnival ride, but that doesn’t take away from the fact that it’s fun. I personally wouldn’t wait for more than 30 minutes, but I could imagine families with young children certainly would wait that long for this ride. 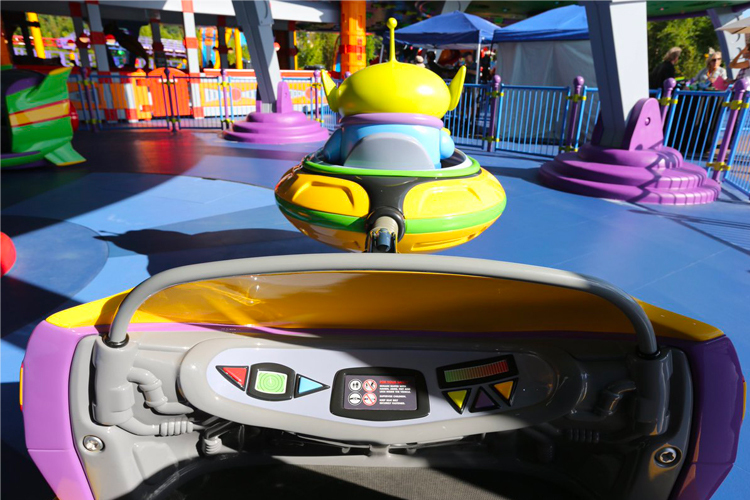 Once the hype surrounding Toy Story Land dies down, Alien Swirling Saucers likely won’t maintain long wait times the way Slinky Dog Dash will. To be completely honest, I was expecting to hate this ride, and while it isn’t my new favorite ride at Walt Disney World, it is something I’d still recommend people try — especially if they’ve never been on Mater’s Junkyard Jamboree in Disney California Adventure. Disney’s Hollywood Studios doesn’t offer a ton of family-friendly attractions, and this ride really helps fill that void. So while it isn’t catered toward me or other adult guests, it was never meant to and that’s okay.